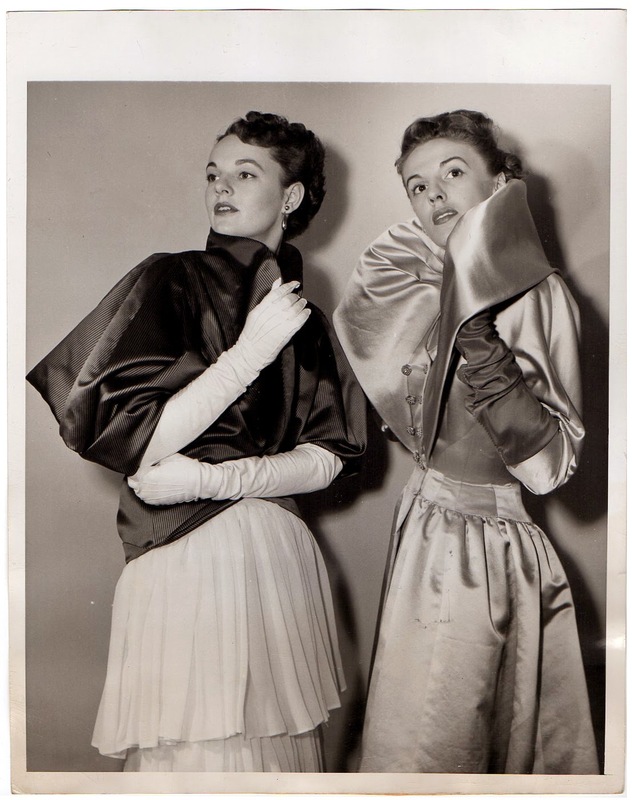 When you love vintage clothing, there's nothing more exciting than finding original photos featuring pieces from your own collection. It really is like archaeology! 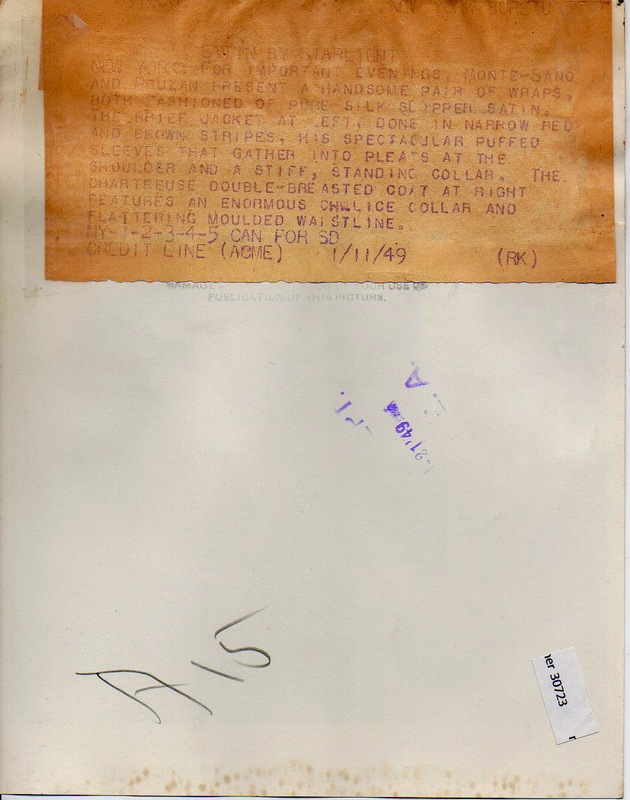 With some popular and well-advertised labels, it can be quite easy to find images from catalogues and advertisements. Brands like Cole, Lilli Ann, Jantzen and Catalina can all be easily documented this way. But with other labels, it takes a lot of detective work or a whole lot of luck. 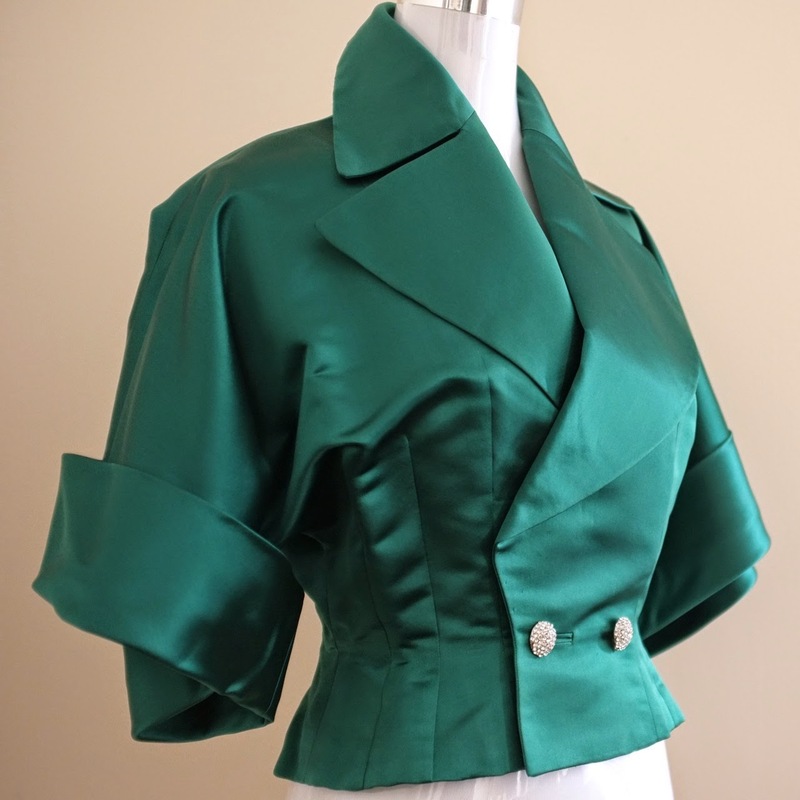 And in the case of this one satin top (and it's accompanying press photo) it was all about luck. 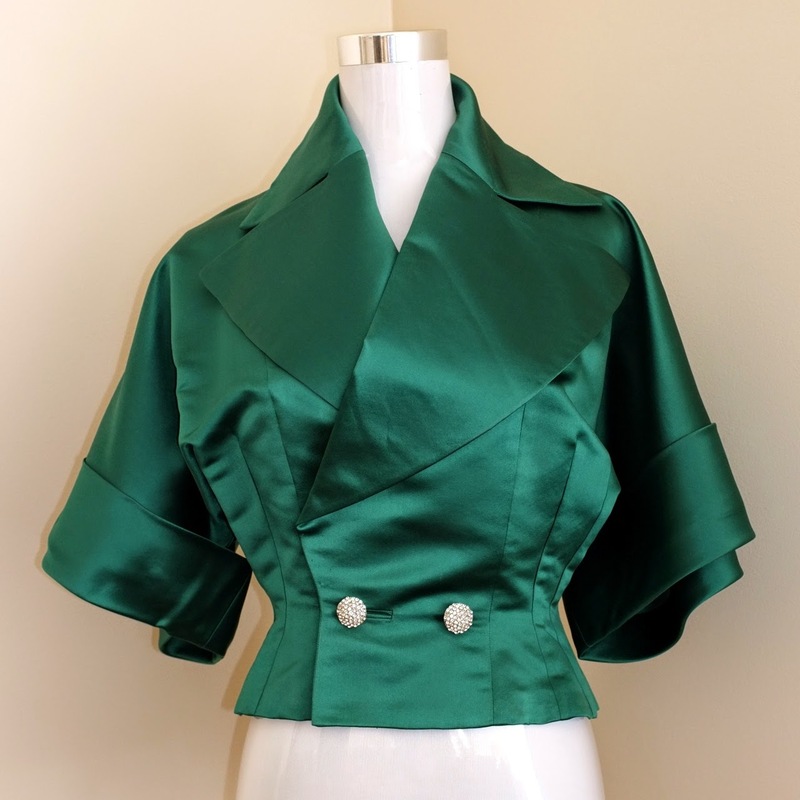 It all started one slow afternoon at work, when I was possessed by the inexplicable urge to type "satin shirt" into the vintage section on ebay. I had never searched for "satin shirt" before, and I don't know why I chose a Thursday afternoon to start. Within seconds, I had found THIS. It had half an hour to go, and it had some ridiculous opening bid like $30. The photos were terrible, but something told me this top would be amazing in person. It was. It really really was. 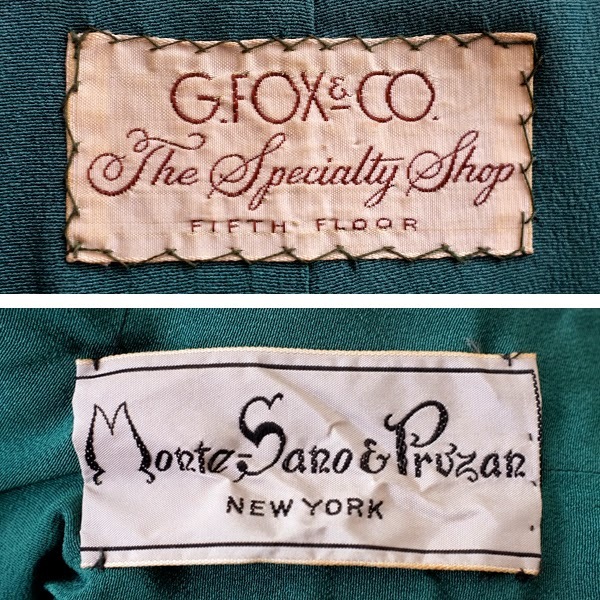 I had never heard of the label Monte-Sano & Pruzan, but the Vintage Fashion Guild had some interesting background information, with a tantalising mention of their designer Jacques Tiffeau, who worked at the label from 1952-1958. It turns out that Tiffeau was quite the flamboyant figure, and began his career as Dior's apprentice (and lover) in 1950. You can read more about Tiffeau in this post from Couture Allure. He sounds like my kind of lunch companion! I've had the jacket for years, but then a few weeks ago, I was browsing on ebay when this vintage photograph came up as "items you may be interested in". Normally I'm not interested in ebay's suggestions, but they certainly delivered the goods that day. I thought the outfits in the picture looked familiar, so I examined the listing closely, and sure enough, it was an original press photo for Monte-Sano & Pruzan, featuring jackets from the same range as my lucky green one. They certainly knew how to write spine-tingling copy back then, didn't they? Makes you want to build a time machine just so you can go back and buy the whole range. Here's to lucky finds and beautiful pictures... Do you have any lucky find stories? Feel free to comment with yours. Lucky finds are the best!